Revolution Lighting Technologies, Inc. ( RVLT) ("Revolution Lighting") was recently commissioned by West Coast Customs (WCC), a market leader in custom automotive styling solutions, to upgrade the lighting system at its new design center and showroom located in Burbank, California. "Our new facility is now truly energy efficient and environmentally friendly. After in-depth review of energy efficiency options, the benefits of LED lighting were obvious and Revolution Lighting's LED solutions were superior to all other options," said Ryan Friedlinghaus, CEO of West Coast Customs. "In addition to using less energy and saving a ton of money, the LED upgrade has provided exceptional lighting conditions that gives the WCC team better vision to bring our clients' dreams into reality." The new RVLT LED solutions provide optimal lighting and burn up to 90% cooler than the original fluorescent fixtures. Within each of the 12 custom workshop departments, the LED fixtures emit a cleaner and brighter light, which allows for higher visibility and greater precision on custom projects. 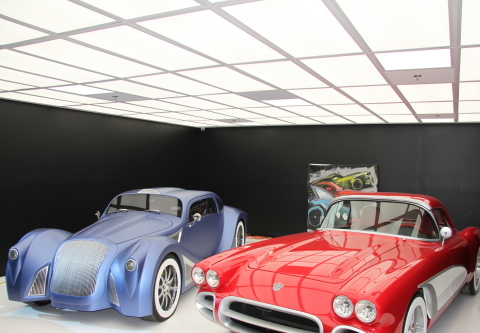 Additionally, in the showroom, thin panel, overhead LED fixtures illuminate the die-cast cars below highlighting the exquisite details of each custom vehicle. "The nice thing about an LED retrofit is that you can do a quality, one-for-one swap using 65% less energy," said Vincent Alonzi, VP Network Sales, RVLT. "We are a 100% LED company; we are trying to create a higher quality of light with a significant costs savings." "WCC is the industry leader in custom auto styling solutions - with only the cleanest, most innovative and design-conscious solutions for their business. This retrofit design redefines what automobile showroom lighting can be," said Ken Ames, VP Sourcing, RVLT. The new renovation project was showcased in a two-part series of the television show, West Coast Customs, on Fox Sports 2. Part one aired on December 21 st and the airdate for part two is TBD. To see video highlights from the project visit RVLT's YouTube page. Revolution Lighting Technologies, Inc. (NASDAQ:RVLT) is a leading LED lighting solutions company. We design, manufacture, market and sell energy-efficient LED solutions with a strong presence in the industrial, commercial and government markets in the United States, Canada, and around the world. Revolution Lighting has created an innovative, multi-brand, lighting company that offers a comprehensive advanced product platform of high-quality interior and exterior LED lamps and fixtures. Revolution Lighting Technologies markets and distributes our products through a network of independent sales representatives and distributors, as well as through energy savings companies, national accounts and its wholly owned subsidiary, Value Lighting, a leading supplier of lighting solutions to the multifamily residential housing sector and new construction marketplace across the U.S. Other brands within our RVLT family include Lumificient, which supplies LED illumination for the signage industry; and Sentinel, a revolutionary patented and licensed monitoring and smart grid control system for outdoor lighting applications. For additional information visit: www.rvlti.com. Founded in 1993 by Ryan Friedlinghaus, West Coast Customs is the premiere vehicle modification shop, internationally recognized for its original designs, beyond your imagination concepts, impeccable quality, cutting-edge technology and unparalleled craftsmanship. Recognized as the game-changing car customization phenomenon that was MTV's Pimp My Ride, West Coast Customs' pop culture status and appeal has catapulted worldwide with state-of-the-art West Coast Customs facilities now open in Dubai, Mexico, Germany, Malaysia, Russia and Japan. The West Coast Customs flagship 60,000 square foot facility is headquartered in Burbank, Calif., with 12 leading-edge departments offering a range of extraordinary custom services for projects of any size, scope or budget.